This rotisserie design is adaptable to a variety of different chassis and bodies by altering the design of the adaptor arms. 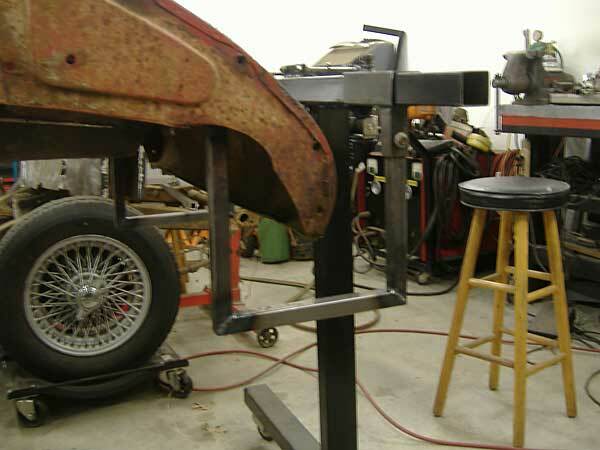 Owning both an MGA and a Midget, I wanted something that would work for both yet break down into reasonably small pieces for storage when not in use. 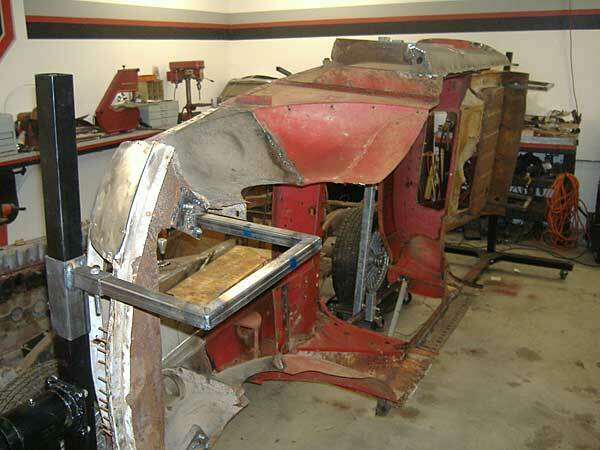 The photos show the rotisserie in use during restoration of my MGA, but different arms would enable use with almost any small car body, frame, or chassis. I'm not an engineer, and I won't guarantee the weight capacity of this design, but it works well for my MGA and I believe that it would be suitable for any lightweight automobile - certainly any British sports car. 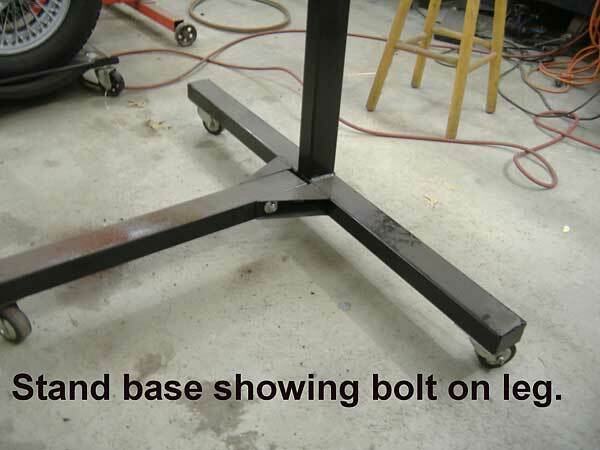 As far as designing an 'offset' for the arms in order to get the best balance for the body, unless you have unusually heavy chassis components installed the center of gravity will usually be located fairly close to the actual physical center of the body. Simply measure the height of the body and make arms that will offset the mounting points one half that amount from the center of rotation. Rotation is controlled by a worm drive from a hand winch purchased from Harbor Freight. 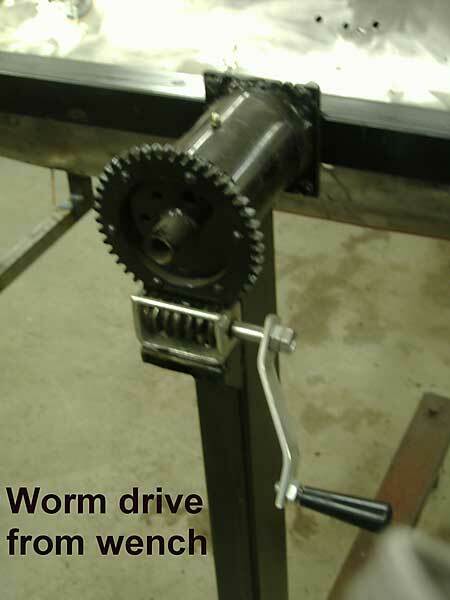 The worm drive components were removed from the winch and adapted for use on the rotisserie. This type of drive allows for complete rotation without the need for a 'pinch bolt'. 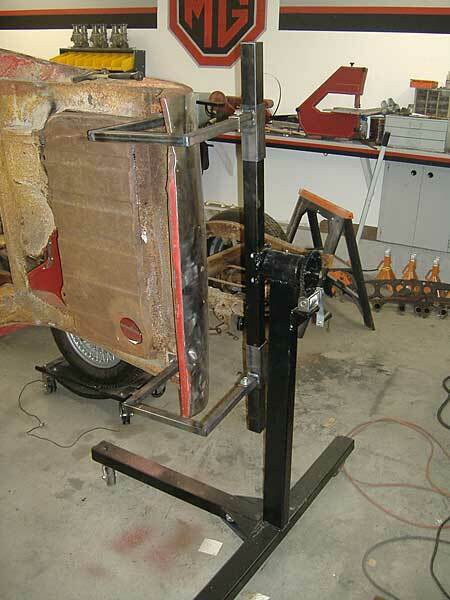 The reduction ratio is 40:1 and effort is very reasonable to rotate the body. Only one drive is necessary; the other end of the rotisserie doesn't require anything but a pivot. 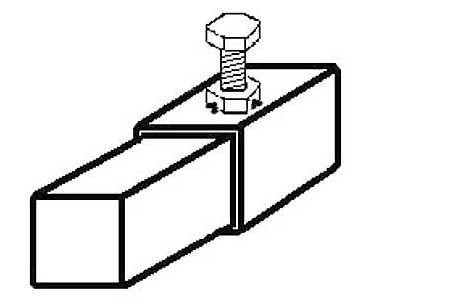 I am using the term pinch bolt to indicate a nut welded to the tubing or pipe and a bolt which threads through that to contact an inner piece of tubing or pipe. This effectively acts as a positive lock to prevent movement between the two pieces. is locked into position when the bolt tip is tightened against it. The rotary heads on each stand were made from steel tubing or pipe. I did have to reduce the size of the larger pieces to make a nice fit with the inner parts. 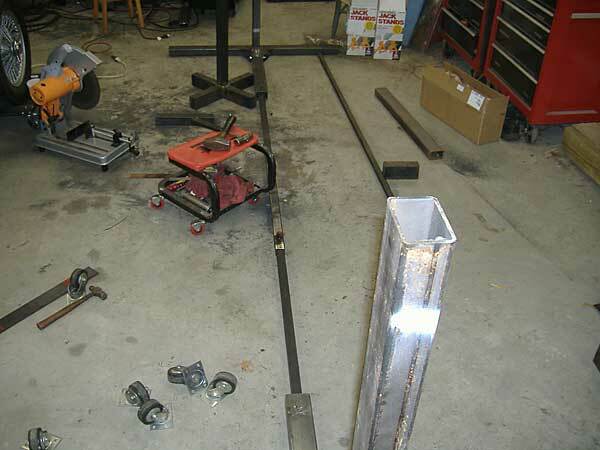 This required splitting one side of the tubing, removing some material and reforming using a hammer and vise until a good fit was achieved, then welding. I added a grease Zerk to each head for lubrication. The inner sections of the rotary heads are removable for maintenance. They are retained by rings with three 5/16" bolts drilled and taped into the inner pieces. The large gear for the worm drive is welded to one of these rings for the drive end. The unit is designed to break down into pieces for storage or transport. The largest piece will be approximately 4' X 4' X 10". The cross pieces to which the adaptor arms are mounted are removable. They are welded to rectangular pieces of steel plate which are bolted to matching pieces on the rotating head. The adaptor arms are of a two piece design consisting of cross bar mounts and the actual body adaptor arms. 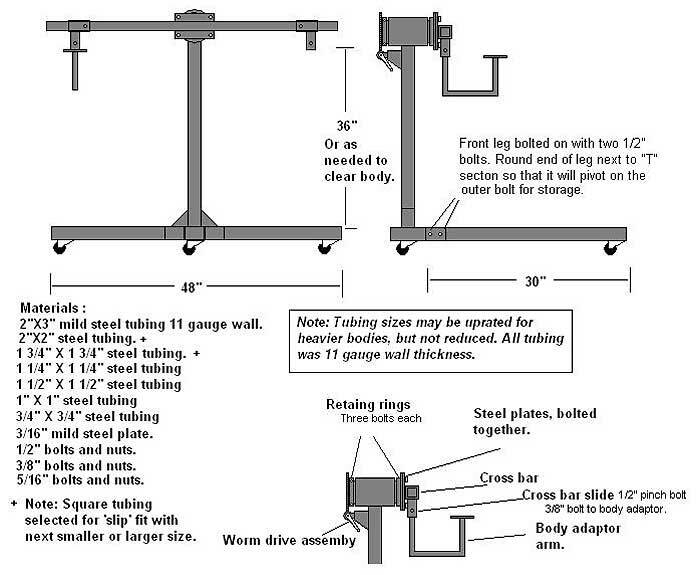 The cross bar mounts are designed to slide on the cross bar and be held in place by half inch pinch bolts. This allow for use on different width bodies, or if necessary, offsetting the body on the rotisserie. 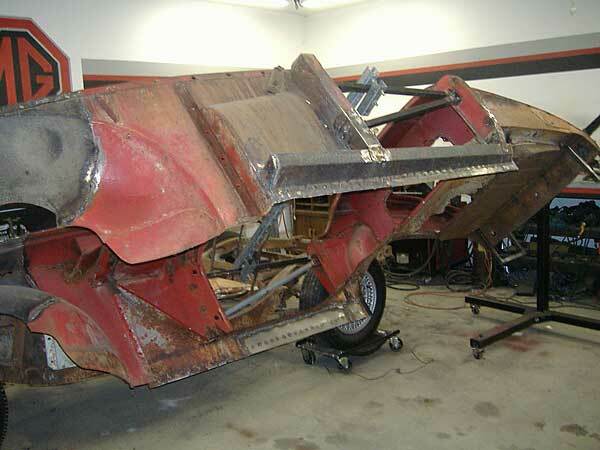 The body mount arms are designed to give as much body clearance as possible in order to facilitate access to the body for repairs or even painting. The body mount arms are bolted to the cross bar slides for ease of assembly and making changing adaptors easier. Disclaimer: This page was researched and written by Bill Young. Views expressed are those of the author, and are provided without warrantee or guarantee. Apply at your own risk. Photos by Bill Young. All rights reserved.